We were impressed by the range of clever design features that make this lean to metal shed suitable for just about any garden. Where space is limited, or where a garden is uniquely proportioned or shallower than it is wide, this shed will still be a perfect fit thanks to its reversible roof pitch and door location. With its taller than average height, it not only saves space it creates space, so we didn’t have to bend down too much when walking in and out. From the pitched roof, down to the high quality galvanised steel used for the cladding, we found that this shed offered excellent weather protection. The lean to nature also provides and extra defence against rain and wind if it’s situated adjacent to a house wall. For these reasons, the manufacturers have been able to provide a 20 year guarantee, which gives great peace of mind. There is no floor as standard, which is understandable on a compact metal shed, but there are options to add a steel foundation kit or a timber floor kit, allowing the customer to choose what kind of flooring they prefer. 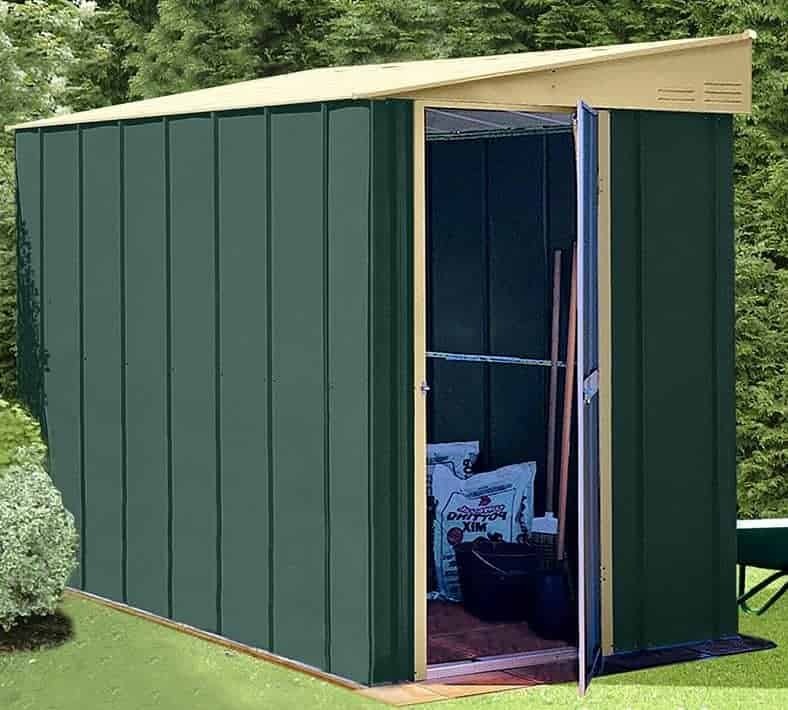 With an option to add a window also available, this is a highly customisable and highly recommended shed. 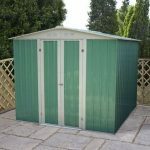 This lean to shed offers several advantages over many others that we review, and the first thing we noticed was the attractive colour scheme. Green walls are offset by a cream door, roof and gable. The painting continues inside and out, and has been well executed with both a primer coat and two finishing coats. This attention to detail was very reassuring, and we found it continued throughout. 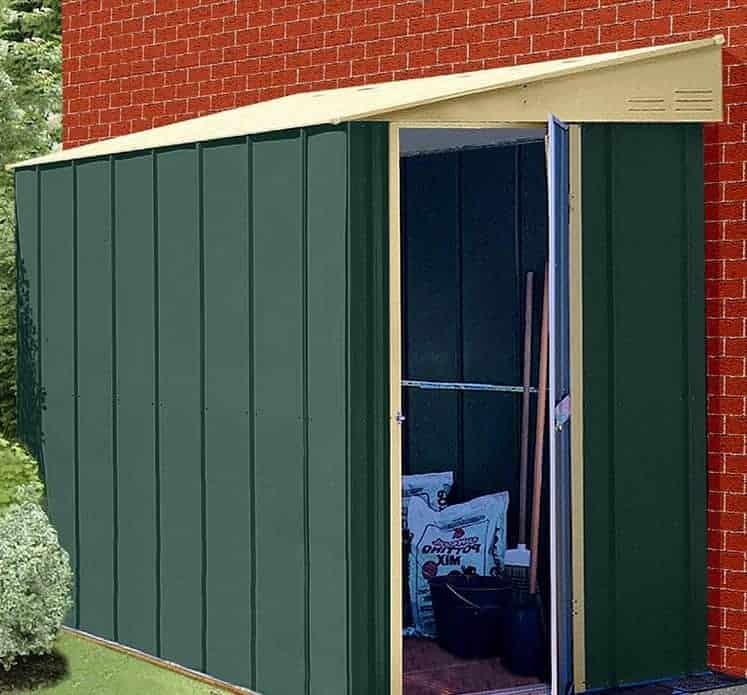 As a lean to, it’s easy to position against a home or garage wall, without it taking up valuable space from the garden itself. We liked that the pitch of the roof could be reversed, and that the alignment of the single door could also be reversed, as this means that it can be adapted to fit in with the shape and design of individual gardens. The pitch of the roof carries rain or snow away, and also helps to boost the storage capacity inside. The roof has a peak height of 1.98m, with an eaves height of 1.78m. The overall dimensions of the shed, which you’ll need to use when finding a suitable area for the base, are 1.22m wide and 1.83m deep including the overhang of the roof. The steel core of the cladding has a thickness of 0.25mm, making it thin and lightweight, and yet we found that the finished shed felt firm and safe. This is down to the hot dipped galvanisation process that bonds zinc onto the steel. The frame upon which the walls are constructed are also made of galvanised steel, but with a thickness of between 0.55 and 0.70mm. No floor is included, as it’s designed to be affixed directly onto a flat area of concrete. We were a little disappointed to find that the screws needed to do that aren’t included as standard, but a set are available as an optional extra. There are other flooring options available too, including a steel foundation kit which helps you create a concrete base of the optimal size, and a timber floor kit upon which timber or decking boards can be laid. The thing we liked most about this lean to shed was the long manufacturer’s warranty. We find that many similar sheds from other suppliers are covered by 10 year guarantees, but Shed Baron offer 20 years’ protection against perforation damage caused by rust. With its metal structure, of course, there is no need to retreat the building as there would be with a timber shed. We found that the single hinged door felt strong and well constructed, and of course the fact that its position can be reversed makes it even more versatile. We’re used to having to stoop down to enter lean tos, so we were impressed at the head saving 1.73m height of the door, alongside its width of 0.65m. There is no window as standard, but there is an option to add one, which again is not something that we always find on metal sheds of this size or price. When inside, we also noticed the benefits of the inbuilt ventilation in the gables, keeping the interior cooler and refreshingly airy. We were pleased that this shed allows users to decide whether versatility or security is most important to them, thanks to the window option. If the standard window free design is kept, security is automatically boosted as opportune thieves will be unable to see whatever’s kept inside. The padbolt supplied with the door is used for fixing the door in place only, so a padlock would need to be added if you are going to store anything of value in the shed. 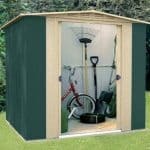 For a shed with a low price point, we liked that so many options are available to the consumer. The first choice to make concerns the flooring. By selecting either the Hilti screws, or the steel foundation kit if no suitable concrete base already exists, or the timber floor kit, the customer can have either a practical and easy to clean concrete floor or a warm and traditional wooden floor. The other optional extra to consider is the sliding window. It lets natural light flood into the shed, so is ideal if you plan on spending any length of time inside. We were pleased that the glazing is made of styrene, being tougher and more shatter resistant than glass. 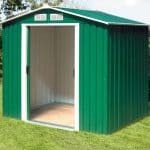 For a shed in this price bracket, we were very impressed with the quality of components. It was lightweight, yet strong. 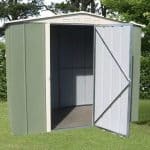 The pitched roof, painted finish, and hot dipped galvanised steel all help to keep rust away, which is why this shed has such a long and welcome warranty period. We liked the tall eaves on this lean to, as it adds vital extra storage capacity. For a 4’ X 6’ shed, we were surprised by how much could be fitted inside. For even more storage space, there is option to add shelving. We’re used to installing sheds in all shapes and sizes, so completed the installation in around four hours. You may wish to allow a few hours more, however, as many of the parts look similar and the instructions can be a little confusing at first. With a guarantee of 20 years without having to worry about rust this offers very good value for money, although there will need to be an additional outlay on a padlock and either a set of screws or a flooring kit. Final Thoughts: We found this surprisingly roomy for a lean to with a compact base area, and thanks to the ventilation the interior was pleasant and welcoming too. This makes it a very versatile little shed, particularly if the optional sliding window is added. 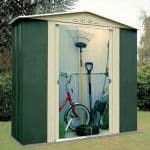 It’s a shed that you’ll be happy to spend time in as well as a storage facility for lawn mowers and even taller garden tools such as hoes and rakes. With a long warranty, you won’t have sleepless nights worrying about the appearance of rust, making it even better value, even with the added expense of one of the flooring options to consider.